Caprese refers to an Italian salad of fresh mozzarella, plum tomatoes, and basil seasoned with salt, pepper, and olive oil. 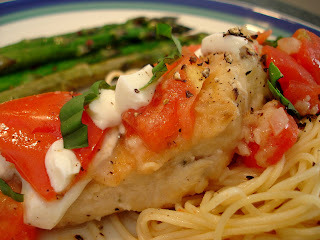 I used that as my inspiration for tonight's dinner - Chicken Caprese served with Cappellini with Tomatoes and Garlic and Roasted Asparagus. * If you are pressed for time the marinade is optional, but I feel it added a lot of flavor to this dish. Instead, season the chicken with salt and pepper, and season your flour with oregano, garlic powder, and onion powder. Mix marinade ingredients and pour into a plastic bag with chicken. Marinate in the fridge for several hours. When ready to cook, remove chicken from the marinade and make sure all of the pieces of pepper and onion are removed. Heat olive oil and butter over medium-high heat in a large saute pan. Season chicken with salt and pepper, and then dredge chicken in flour, shake off excess, and add to the pan. Saute for 3 minutes on each side, or until golden brown. Remove chicken from the pan onto a dish and cover with foil to keep warm. Lower heat to medium and add wine. Let simmer for 1-2 minutes while scraping up brown bits. Return chicken to the pan, cover, and let simmer for 10 minutes. Add tomatoes and let simmer for 5 minutes. Top each piece of chicken with a few pieces of mozzarella. Top with tomatoes from the pan, sprinkle with basil, top with some freshly ground black pepper if desired, and serve over pasta. Making chicken using this method - dredging in flour, searing, then making a wine/broth sauce - is a good base for any chicken dish. You can change the flavors and make it anything you want. Some other dishes I've made this way include Creamy Dill Chicken, Chicken with Tomatillos and Roasted Poblanos, Chicken with Crimini Mushrooms in a Sage Sauce, Chicken in a Chipotle-Red Pepper Sauce, Chicken Piccata, Lemon Dill Chicken, Chicken with Artichokes/Lemon/Thyme, and even Fish in a Lemon-Wine Sauce. I was so happy with this chicken and would highly recommend it, especially if you love the flavors of fresh tomatoes and basil. Bring a large pot of water to a boil. I like to add some olive oil to the water. In the meantime, heat olive oil in a saute pan. Add garlic and onions and saute until soft, about 3-4 minutes. Add tomatoes and juice. Let simmer for 4-5 minutes. Once pasta is cooked and drained, add to the oil mixture. Toss. Add Parmesan cheese and top with basil, if desired. The size of the cappellini made it a nice, light summer pasta dish. It went perfectly with the delicious chicken - I'm definitely making this one again!! And to round out the meal, I made roasted asparagus. I tossed fresh asparagus spears with olive oil, salt, pepper, and just a touch of red pepper flakes. The asparagus roasted in the oven on 400 for about 8-10 minutes. I loved everything about this meal - it had all of the summer flavors that I love and was pretty healthy, as well. I hope you enjoy this if you make it too! This looks great, Mary Ellen! I would definitely love this! I'm going to try this next week. It looks like the perfect hot weather dish! I love caprese. That sounds like a perfect summer meal. 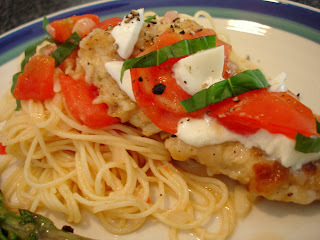 I love the flavors of caprese salad, and it sounds great with chicken! I love the flavors of fresh tomatoes and baisl; it's a wonderful combination of flavors and great for the summer. You have also been tagged! Visit my website. I made this dish about a month ago and it received rave reviews from myself AND my super picky husband. It is now on the regular rotation. Thanks for sharing!